[toc]Thick, healthy hair is a goal for many men and women. Due to increasing stress levels and exposure to toxins, pollutants and chemicals, hair problems are on the rise nowadays. Women and men often try shampoos for lustrous hair, making their hair strong and countering baldness. 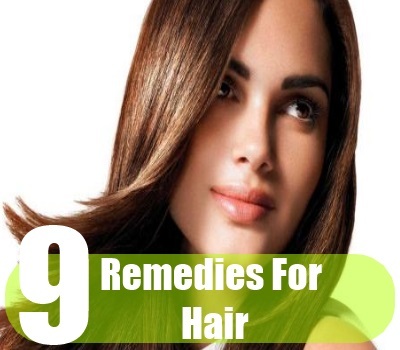 But herbal remedies are often the quickest and most effective solution to ensure healthy hair. Herbs which can be used to make hair healthy and strong include Rosemary, Chamomile, Gingko Biloba, Ginseng, Indian Gooseberry, Bacopa, Sage, Siloca, Hops, Lavender, Horsetail, Marshmallow, Elderberry and Burdock. Most of these herbs initiate healthy hair growth and strengthen the hair. To make your hair soft and shiny, these herbal remedies are unbeatable. Emblica Officinalis is the Latin name of this herb. Indian Gooseberry is also called Amla in the Indian subcontinent. This herb is referred to as Yu Gan Zi in China. This herb is native to Asia and the Middle East. Indian Gooseberry is used as a hair tonic by Ayurveda practitioners. You can boil the fruits of this herb in coconut oil and apply this mixture on the hair for stimulating hair growth and countering hair dryness and damage to the hair. 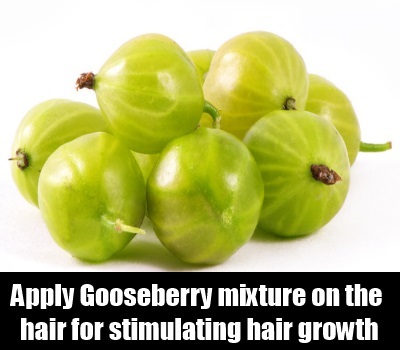 Indian Gooseberry fruits can also be eaten in raw or dried form for beneficial outcomes for your hair. Bacopa is referred to as Brahmi in India. This herb is also used in Ayurveda to ensure healthy hair. Bacopa can cure scalp dryness which may be leading to dandruff or hair loss. Bacopa which is also known as Indian Pennywort is a herb that can make hair stronger as well. Bacopa contains active ingredients which strengthen the hair and make it healthy by improving the circulation or blood flow to the scalp. 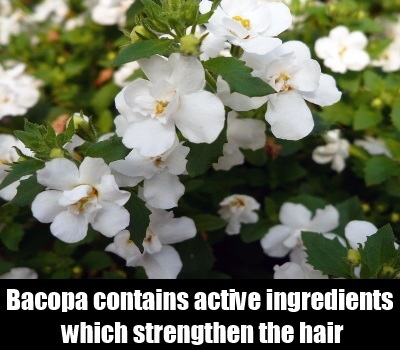 Bacopa is a common ingredient in hair oils because of its remarkable properties. You can crush Bacopa leaves and mix them with hot water. Then, you can apply this paste on your hair. Leave this paste on for about 20 minutes and then rinse your hair. Daily hair wash using this herbal remedy will prove vastly beneficial for your hair. Equisetum Arvense is the Latin name by which this herb is also known. 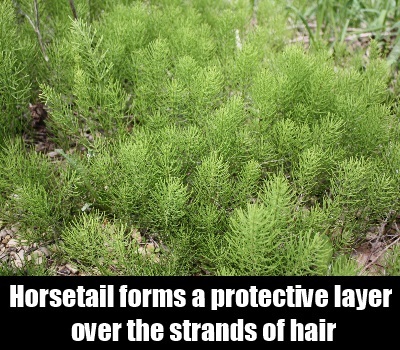 Horsetail contains a substance called silica which forms a protective layer over the strands of your hair and makes your hair smooth and manageable. The stem of this herb can be boiled in hot water. Let the mixture simmer for awhile and then strain the liquid through a clean cloth or strainer. Use this Horsetail infused water to wash your hair and you will get immediate but long lasting benefits. Horsetail stem can also be crushed and used as a conditioning agent after washing your hair to make it smooth, silky and shining. Salvia Officinalis is the botanical name by which Sage is also referred to. 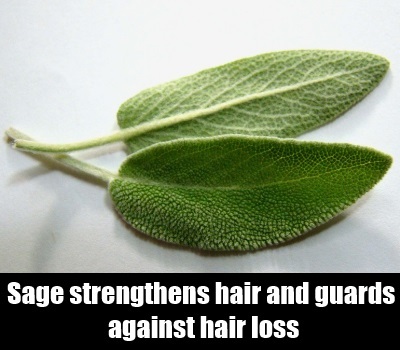 Sage contains 5-alpha reductase compound named beta-sitosterol which strengthens hair and guards against hair loss. Sage also has the ability to stimulate new hair growth by stimulating the follicles of the hair’s strands. Sage leaves can be mixed with carrier oils such as Olive oil or Avocado oil and the oil may be applied to your hair to improve its strength and vitality. You can also crush Sage leaves and mix them with some oil or water and coat your hair with this paste. It can be washed off and regular use of this paste can ensure a healthy scalp and thick hair. Althea Officinalis is the Latin term assigned to this herb. It can revitalize your hair, nourish it and protect it from scalp infections as well as dust particles. 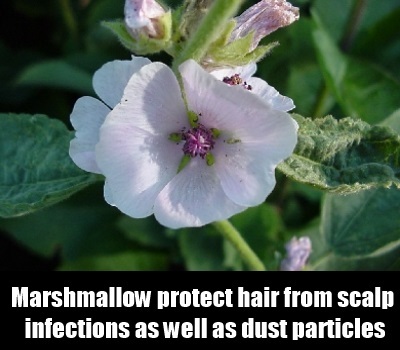 Marshmallow root contains mucilage which is a gel like substance that can form a protective layer over the hair and guard it against destructive forces such as chemicals, harmful bacteria, dust and irritants which damage it. You can crush Marshmallow root in a blender till it becomes a soft paste. Use this paste to make your hair stronger. You can apply the paste directly on your hair and use it as a conditioner after washing your hair for good results. Gingko Biloba is most popular as a herbal remedy for improving circulation and strengthening your immune system. But this herb also has other interesting facets. It is excellent for preventing hair loss or damage to the hair. 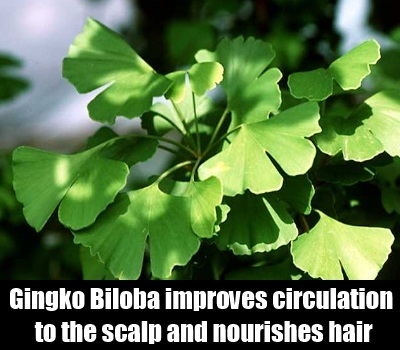 Gingko Biloba extract improves circulation to the scalp which provides nourishment for your hair. It also protects the body from infections which can damage your hair. Gingko Biloba can also be taken in the form of a supplement or capsule. It is perfect for revitalizing your hair and protecting it against dryness and dandruff. 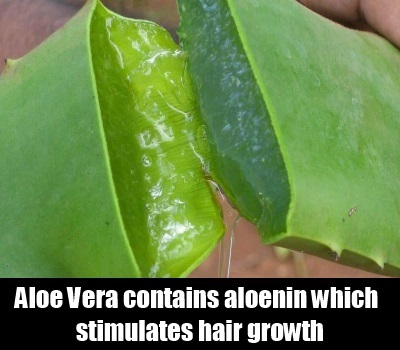 A substance in Aloe Vera called aloenin stimulates hair growth and improves the quality of the hair. Aloe Vera gel can be extracted from the mucilaginous inner part of its succulent leaves and applied directly on your hair for getting relief from the dryness of hair strands. Aloe Vera is also an excellent moisturizer which lubricates your hair and makes it shiny. Aloe Vera is an antibacterial herb. So, it can also protect your hair from damage caused due to scalp infections. You can also add some Aloe Vera juice to your bath water and use it to wash your hair for outstanding results. Hair becomes soft and smooth if you use Aloe Vera regularly. Ginseng comes in three varieties mostly namely Siberian Ginseng, Asian Ginseng and North American Ginseng. Each of these three are equally effective for restoring hair growth and making your hair healthy. Ginseng encourages circulation in the scalp due to which the hair follicles receive plenty of nutrients and nourishment. This stimulates healthy hair growth and ensures that the person becomes healthy as well. 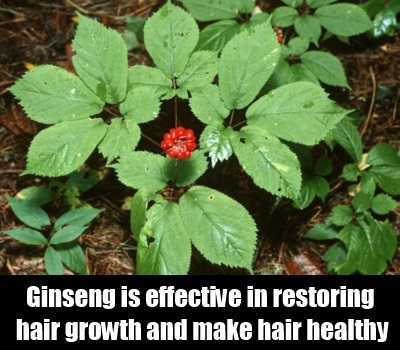 Ginseng also eliminates toxins from the body which leads to healthy body and shiny hair as well. Ginseng can be taken as a capsule or an extract or supplement for best results. Chamomile is a herb which soothes the nervous system and makes a person feel relaxed and pleasant. 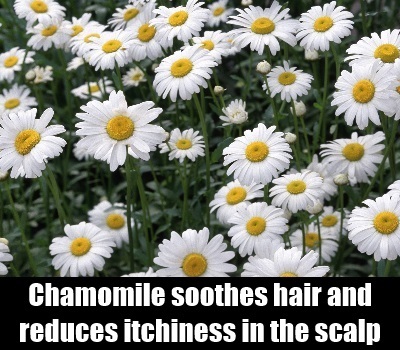 Chamomile is also good for your hair. Known botanically as Matricaria Recutita, Chamomile soothes your hair and reduces itchiness in the scalp. This promotes healthy hair growth and also ensures less chances of hair breakage. Chamomile oil is readily available in the market. You can also make Chamomile infused oil by soaking the leaves of this herb in a sealed jar of Olive oil for about 3 days and then using this oil to massage your scalp for healthy hair. Chamomile oil can be directly applied to your hair after washing it for good outcomes.